The OnBoard New York Tour begins at the heart of the city — Times Square. Most people assume that Times Square is actually a square, but it’s not. It’s more of a triangle or a mere intersection of major streets. Broadway and 7th Avenue cross at 42nd street, creating the busiest area in New York City. Times Square got its name because the New York Times building was built there, long before it became a showcase for neon lights and digital big-screen technology. The New York Times moved away, but the name stuck. The tradition of celebrating New Year’s Eve in Times Square was also started by the New York Times, when it began putting on an annual fireworks display in the area. Now, more than one million people gather every year on New Year’s Eve to celebrate the beginning of a new year in New York City. If you are looking to shop while you are in New York City, Times Square is a great place to do it. There are plenty of souvenir shops in the Times Square area. You can also get great deals on electronics in the “mom and pop” stores that line the streets. Also, if you like people watching, this is the place it was invented. All walks of life walk through Times Square every day and night. Your OnBoard Tours tour guide will tell you all about Times Square and its history. Your guide will show you the famous ball that drops at New Year’s Eve every year (you can also see it in the video below). All of the OnBoard Tours also end at Times Square, at the same place where they began. 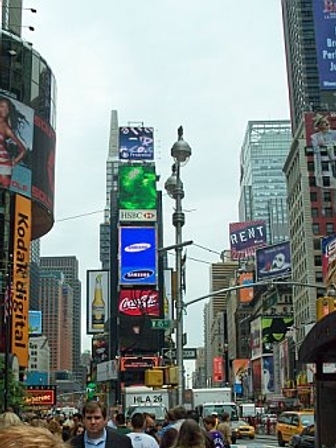 Around Times Square are the major Broadway theaters. Let us know if you are interested in purchasing tickets to see Broadway Shows while you are in town. We have connections that can help you get the best seats in the house. Our customer service ambassadors can help plan your entire trip, including purchasing your Broadway show tickets in advance so you don’t have to worry about the show you want being sold out. We can get tickets for Wicked, Lion King, Jersey Boys, Phantom of the Opera, and more! Article Copyright 2008 by OnBoard New York Tours. Webmasters and E-Zine publishers should request permission to reprint by email link below.